Although Sansabelt pants, Clapper light switches, and robovacs are looked upon with great fondness by the motivationally challenged (read: lazy) among us, the ne plus ultra for the lounging class is Sunday brunch. You can eat it in bed or at the breakfast table — in flannel, either pink polka-dotted or gray — and any time between the hours of 10 a.m. and 2 p.m. Even the term brunch is the result of quintessential laziness. Instead of racking our brains for a unique name, we simply made an amalgam by scrunching together breakfast and lunch into one poetic term. The problem, though, with being among the multitudes who consider Sunday morning the next best thing to a national holiday — hence our right to sleep late — is that few of us have the constitution to rouse ourselves to actually cook. The idea of stumbling out of bed clear-headed enough to wield sharp objects and making something that would astound friends is, quite frankly, foreign to us. That’s why there are restaurants. 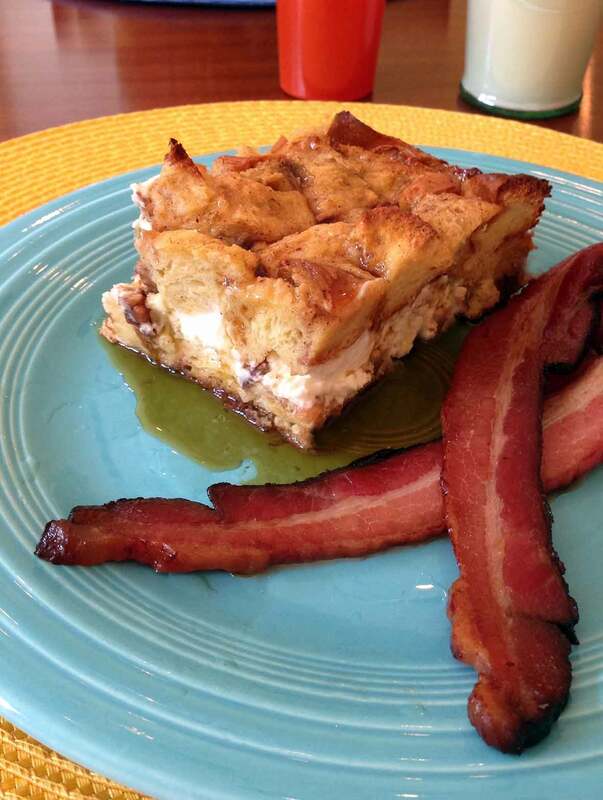 Still, there are advantages to lazily brunching at home, so I was intrigued when I encountered a particularly appealing deep-dish French toast while loafing at the Black Boar Inn in Ogunquit, Maine. Impressed by its craggy, deeply toasted top, warm chunks of cream cheese, and a strata of nuts and raisins, I requested the recipe. As with many restaurant recipes, what emerged from the oven bore little resemblance to what we had eaten that crisp autumn morning. Impossible-to-copy chef improvisations, extra steps, and tiring techniques undoubtedly went into the making of the dish. What interested me, though, was the instruction to the cook to let the whole thing sit overnight in the refrigerator. Now this was approaching the land of leisure cooking. It meant that if I set the table the night before, I could get up at a decadently late 10 a.m. and have brunch ready for a tableful of guests by 11:45 a.m. This was almost as luxurious as switching to Daylight Standard Time. I set about tearing apart the recipe military-style in order to build it up lazy-man-style. First, a brioche loaf would be used instead of plain bread, to offer extra egg richness and flavor. Brown sugar and warm spices, such as cinnamon, nutmeg, and cloves, would be added to the beaten eggs to save a step. And when the French toast was baking, a drizzle of melted butter on top would eliminate having to slather it on. My guests would need only warmed maple syrup — 45 seconds in the microwave, max. The Saturday-night assembly took all of 20 minutes, including cleanup. I put the dish in the fridge and watched “Curb Your Enthusiasm.” But all through the show I was consumed by one obsessive thought: Should I use paper plates? Once a lounger, I guess, always a lounger. Photo © 2013 David Leite. All rights reserved. All recipes and photos used with permission of the publisher.